I spent the night at the Patriarch Grove. This made more sense than driving back to basecamp, only to return an hour or two before sunrise. Sleeping in my car saved a 2 and half hour round trip. I forgot one important thing though — my sleeping bag. It was an uncomfortable night’s sleep, but I made do. I wore my hooded jacket, and made the best of the situation. I awoke several times throughout the night, and it became increasingly difficult to stay warm around 1AM. I ran the engine a while to warm the interior of my vehicle, but it would only last so long. I eventually wrapped the foldable metallic sun shade around my legs — this sufficed to keep me warm. Needless to say, I didn’t have a problem oversleeping my alarm clock. I set out for my camera at 3:30AM. A half moon illuminated the dolomite slopes, and the twisted skeletons of ancient trees were silhouetted against the deep blue of night. There was no need for a GPS, or even a headlamp that morning. It’s amazing how much light was reflected by the pale rocks at my feet. I traversed the moonscape, and my camera soon came into view. It was a small black dot high above on the hillside. All traces of yesterday’s thunderstorms were long gone, and dark sky was filled with millions of shimmering stars. Despite the half moon, I could clearly see the milky way. I removed the protective trash bag from my camera, and set the aperture to f/64 for depth of field. The vertical trees mandate a parallel plane of focus, so I couldn’t use lens tilt to achieve a better aperture. Though I didn’t think f/64 was enough to achieve both foreground and background focus, the most important parts would be sharp. I’ve long since given up on achieving technical perfection. This is one of the many lessons I’ve learned while shooting large format. I inserted a film holder loaded with Kodak Portra 160, and began my first exposure. I knew the stars would not register on my film at f/64, but my goal was to capture a combination of moon light, and the warm glow before dawn. I ended my exposure when the sky in the background metered at 15 minutes. The 40 minute exposure captures the subject first under moon light, followed by the warm pre-dawn glow that I love so much. I like how it captures the mystery of this grove, and reveals little about these strange trees. Upon completing this exposure, I replaced the dark slide and flipped over the film holder. I made a 10 minute exposure on the other sheet of Portra 160. Unfortunately, the second sheet of film didn’t turn out. Though the exposure is fine, it suffers from a slight double image. I believe this is attributed to the film settling in the film holder during the exposure. This has happened to me in the past, and it’s always on horizontal shots. I wasn’t thinking properly that morning, and forgot to tap the top of the film holder to settle the film. Live and learn. Moments after taking my second (flawed) exposure, the magical light was gone. The sky turned bright cyan, and the light was flat. My next opportunity to shoot was after sunrise when the hillside around me was bathed in fiery light. I inserted a film holder filled with Velvia 50, and waited for the first rays of light. It was a hazy sunrise — hardly what I expected. There was no profound moment when the light of sunrise swept over the land. Instead, it built little by little. I stared at the rising sun, then back at the slope behind me. This was it? The light wasn’t as mysterious, or enchanting as the light before sunrise, but I still felt compelled to make an exposure. I metered the scene at 1 second @ f/64. I cocked the shutter, then pressed the cable release. The shutter sprung open, then made a laboriously slow grinding sound. It stuck open for 5 or 6 seconds, then reluctantly closed. The light wasn’t all that impressive, but it’s never a great feeling to absolutely fry a sheet of 8×10 Velvia 50. This film is now discontinued. I returned to my car and spent the morning loading film. I hoped to take another shot that afternoon, but I wasn’t quite sure where. My goal that afternoon was to photograph a closeup detail shot of a Bristlecone Pine. I’m fascinated by the curves, textures, and colors these trees showcase when viewed up close — but I knew it would be difficult to find just the right shot. I left my big camera behind, and scouted the nearby hills with only my lightweight pack. I listened to various podcasts, and walked from tree to tree in search of just the right subject. After exhausting my supply of trees within the main grove, I checked out another grove a mile or so away. These trees were more exposed to the elements, and displayed the tortured character I was after. I kept vigilant watch over the sky that afternoon. Much of my exploration was on high exposed ridges — the worst possible place to be during a thunderstorm. I crested a small ridge, and stared in awe at a small tree. This was my subject. I felt an invigorating rush, and knew I had to return with my camera at once. The conditions would soon be right to take this photo, and I needed time to set up the composition. I descended the slope under increasingly heavy skies. Large drops of rain fell from the sky, though the cloud directly above me was far from threatening. I enjoyed the smell of the rain, and the wonderful breeze that came with it. With the threat of violent thunderstorms still a possibility, I returned to my vehicle, and found a place to park much closer to my prospective shot. The subject I set out to shoot measured roughly one foot across. I know from past experience that my 300mm lens will shoot subjects at nearly life size when I overextend the bellows. There was no question that I could get the shot, but the difficulty was the angle. To get this shot, I would need to position my camera directly above the tree, and shoot straight down. This requires very creative tripod placement, and it makes my camera even more sensitive to the wind. I returned to the mountain ridge, and began setting up my camera. It didn’t take long for me to become apprehensive about the weather. I glanced over my shoulder, and saw a large thunderstorm forming just to my south. This wasn’t good. Just then, a crack of thunder echoed across the valley. It would take too long to break down the camera and put it back in my bag. Instead, I covered it with a trash bag and high-tailed it back to my truck. I drove to a lower position, and stayed in the safety of my vehicle as the storm rumbled overhead. A thick curtain of rain fell just to my east, and several bolts of lightning streaked across the turbulent sky. Later that afternoon, I returned to the ridge under clearing skies. My camera was fine without so much as a drop of rain on the trash bag. 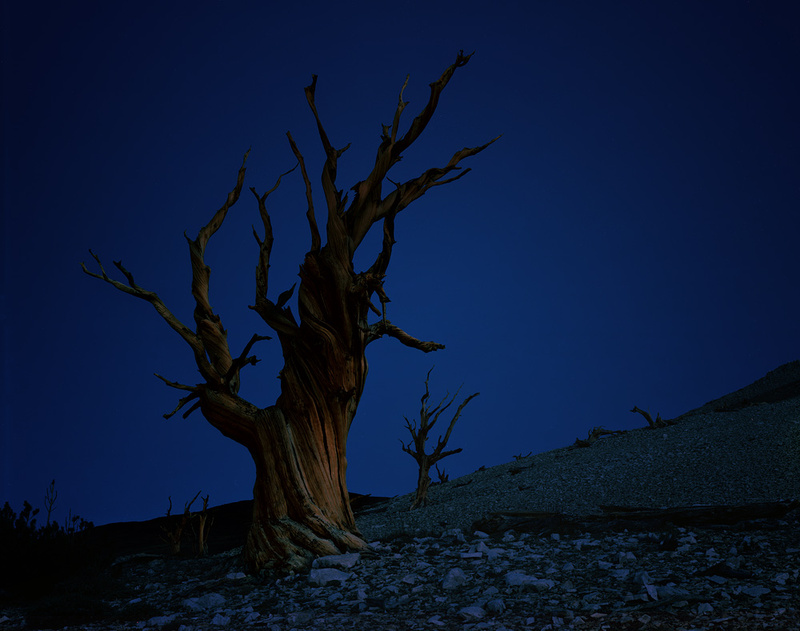 My subject for this shot was the remnants of an ancient Bristlecone. All that remained of this tree was the vestige of a trunk, and what’s left of the root system. I was amazed to find that it smelled of fresh wood — despite being perhaps older than the pyramids. The twisted roots of this tree grew around an angular white rock the size of a bowling ball. After being entombed for thousands of years, this rock was now breaking free of its wooden embrace. The color, the texture, and the form were exactly what I had set out to capture. 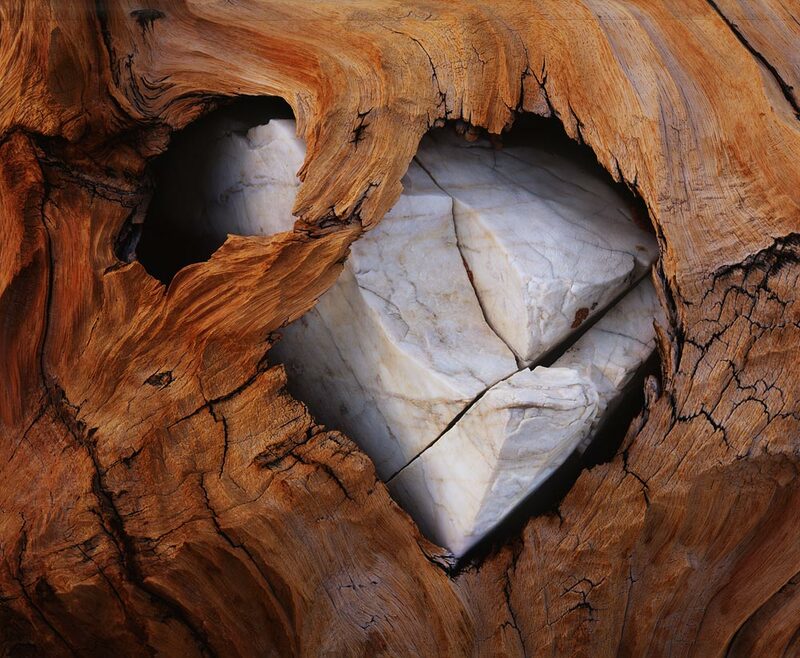 Oh, and did I mention that the gleaming white rock was in the shape of a heart? I knew the significance of this shot the very moment I saw it. This small monument of wood and stone represents the enduring nature of these trees, their will to survive, and their elegant dignity even after demise. It was the very soul of the White Mountains. I carefully studied my composition on the ground glass. The subject was far from flat, so focus was difficult. I made the decision to focus part way into the scene, then stop the lens down all the way for any chance at depth of field. I waited until the sun set behind a peak to the west, then shot a series of photos under calm, indirect light. It was still quite windy, but I waited for each break in the wind before triggering the shutter. This entry was posted on September 22, 2012 at 5:00 am and is filed under 8x10, Photo Trips, Photography, White Mountains Aug 2012. You can follow any responses to this entry through the RSS 2.0 feed. You can leave a response, or trackback from your own site. Two superb shots. Wow very nice ! Hey Ben I’ve read these posts everyday and I love them. Incredibly well written. Ben the shot of the rock in the tree’s dying embrace is awesome! I was watching this on my phone before I read the blog post and thought “He’s looking knackered” – guess the forgetting the sleeping bag will do that. You have got some breathtaking shots on this trip, especially “soul of the ancients” and the panoramic for day 4. I hope you’re pleased with them, cos I’d be delighted! Te soul of the ancients is just awesome! Good eye. Major enlargement! That sounds more like a nap.